A partnership with Mr Men Little Miss and Haliborange has seen 13,000 Mr Men Little Miss books given out to families across four of the areas in which we run Hubs and local campaigns. 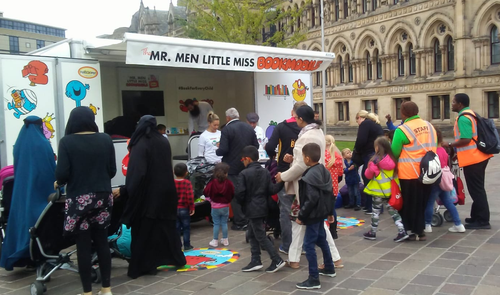 The travelling Bookmobile visited National Literacy Trust Hubs in Bradford, Nottingham and Peterborough, and the Read Manchester campaign in Manchester. The tour was a joint initiative from Mr. Men Little Miss and the UK’s number one kids vitamins brand, Haliborange. Families in each area got the chance to pick up free books and vitamins, and even meet a 3D life-size Mr. Strong who was brought to life using AR technology. The Bookmobile tour aimed to support children’s reading and cognitive development and help parents and children spend more time reading over the summer holidays. Through our Hubs and our local campaigns, we work with local partners in each area to deliver a range of programmes and activities to reach raise literacy levels. Find out more about our Hubs and local campaigns.